If you said the words “romantic moated manor house” a building like Birtsmorton Court might well come to mind. A structure that has evolved over seven or eight centuries, this beautiful house is made up of a mixture of timber-framed, stone, and brick wings, all different but wonderfully harmonious, set in quiet countryside, and partly shaded by trees. Birtsmorton may have been begun in 13th century, but in the 15th it was bought by one John Nanfan, who rebuilt most of it. In subsequent centuries, the house was home to various landed families (including relatives of Richard Hakluyt, the writer on exploration, and the family of William Huskisson, the statesman who was the first person to be killed by a railway train) and several of these later occupants made substantial alterations to the building, producing the delightful hotchpotch that remains today. My photograph shows the view from the south, where there are buildings of various periods in different materials. On the right, the house is stone below, timber-framed with brick infill between the timbers above; this timber-work is a replacement of 1929–30 of earlier work that had been destroyed by fire. On the left is a contrasting brick wing built in the 18th century, with sash windows. Between these two parts is a mixture of various dates, with a pair of timber-framed bays, some stone walls, and tall brick chimneys. It would take a long time to unpick the complex architectural history that produced this rich and diverse collection of walls, gables, roofs, and chimneys. Even for someone with expertise in the archaeology of buildings it would be a challenge, and one would need to have the run of the place for some considerable time. As Birtsmorton is still a private house, archaeologists are not likely to be unpicking it any time soon. Even if its detailed history is hard to decipher, though, its visual harmony is intact, and a thing to marvel at. The house is available for events such as weddings, and there’s more information about it here. It's an amazing place. 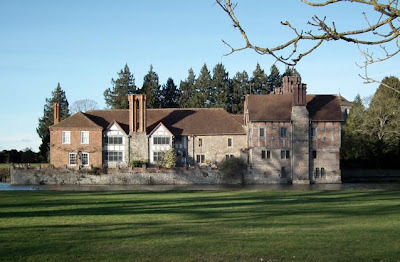 The entrance front (nearly all timber-framed with brick nogging) is also stunning, but one would have to go on private land to photograph it properly. It strikes me that there are very few of these moated houses in private hands now. Of the others, Broughton Castle is a favourite. Available for weddings, what about for squatters? It is beautiful! Ann: Chuckle. I don't suppose I should encourage squatters – some bumbailiff may descend on me! But if you look at my post on an interestingly named place called Hollybush (http://englishbuildings.blogspot.com/2009/02/hollybush-worcestershire.html), you will read something of the history of squatting. Gosh - what an extraordinary building! Your straight-on photo does not show the complex inter-relationship of its different elements as clearly as the oblique angle on the website. Anon: Yes, the angled photograph is better from that point of view. The angle of view I chose for my own photograph was a compromise involving the direction of the light and the fact that I didn't want to stray too far off the public footpath. Another interesting connection is that Thomas Wolsey (later cardinal) was the Nanfan family chaplain for a period. Interesting family: the heiress, Catherine, married Richard Coote, later 1st Earl of Bellomont; their son, the 2nd Earl, was given the name Nanfan Coote. The survival of wonderful buildings like this is often due to the fortunes (or lack thereof) of the families that owned them. Presuambly none of the owners were wealthy enough to demolish and start again from scratch with something more "modern", or they had somewhere else to live and didn't care to spend money here; but someone added the Georgian wing - but perhaps not enough money to rebuild the whole house - and a later owner had the funds and the inclination to rebuild the medieval wing after a fire. Many country houses were demolished between 1900 and 1970, often with less reason than a catastrophic fire.